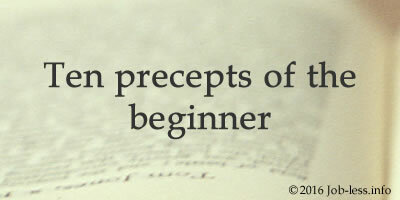 Article #2: 10 precepts of the beginner. In the matter of job hunting is important to take into account all aspects. It is significant not only to find the optimum option, which can satisfy your high inquiries, but do not lose it because of your carelessness to "trifles". How not to lose the coveted work at the initial stage, and get the place into a friendly team? Remember, being a novice is always not easy - but all once started with it. There are few people who in a moment start feeling themselves like "a fish in water" in a new situation, and discontent at first is quite normal. It is standardly that some moments aren't pleasant to you, nevertheless, don't show dissatisfaction. If with certain facts yet you cannot reconcile, you unambiguously are able to leave this job any time. But until making a final decision, it's necessary to be polite, keep tenacity and stay "a fine fellow". Even if you really wish to demonstrate the deep inner world or irrepressible creativity, at first it isn't necessary to engage in discussions with the leaders, arguing how to act in a given condition. Better try to show your capabilities, perfectly performing all affairs entrusted to you. At the new place do not immediately seek to optimize all processes. For a start take a look, whether it does not hinder someone. Instructive comments from the novice almost always perceived with hostility, but when you grow to the "piece" of the "staff's unit ", the colleagues will take pride in your creative ideas. Whatever strict are your personal traditions, try not to reveal them. Surely, you appreciate and honor them. But to the new colleagues your habits can seem unusual or even wild. The time would come when the team calmly will look at your thermos with buckwheat. And it would become quite acceptable for them to see you, wearing an extravagant jacket or bright and colorful scarf. But at first all this would be considered as an unacceptable eccentric. Don't try to surprise the bosses with the fantastic working ability and readiness to carry out any task. There always will be dissatisfied whisper of colleagues behind your back; while the management may not approve your zeal, seeing in this a desire to curry favor. At first, you should be prepared to the fact that you would be "overburdened" of colleagues' duties. Even if you cannot stand to send faxes, buy newspapers, and your office doesn't imply all these actions - don't enter the conflict. Perhaps, such is here fate of "beginner". "Do not being late" is generally a good habit. It will come in handy for you and later. Still first punctuality is especially important. As for leaving work, attentively observe the co-workers' collective, and act the same. There are companies where it is allowed to leave early, but there are also some where slightly overstay is the norm. Don't participate in conversation on personal themes by an office number. If it is so important, try to restrict your communication to very short one. The usage of your own phone is not a good idea too. Its call can cut colleagues' hearing; therefore they would be listening and discussing your talks. Go out into the hallway with a mobile is even worse. It characterizes a person as secretive; and will be regarded as an attempt to gossip about the colleagues. Establish low loudness and communicate briefly. Do not rush to install program of on-line communication at new work or talking about it excitedly to friends by e-mail. Many companies attentively follow, how the staff member, especially a novice use "the computer's potential" over the day, and even read his personal letters. Be ready for such control. At the beginning colleagues wonder what the novice wearing or what shoes he prefers and how it suits him. So, try to dress neutrally, accurately, not brightly, in the pure, ironed clothes - thus you wouldn't give them an occasion to carp to your appearance.